This topic contains 19 replies, has 6 voices, and was last updated by Ian 4 months ago. Update failed. And then the device password box fills with dots. See attached screenshot. This topic was modified 4 months ago by jeffhaas. First of all, make sure you’ve input device password correctly — it’s your OpenSprinkler’s device password (it’s opendoor if you have never changed it), not your WiFi password or anything else. Second, if update failed, give it another try. Sometimes the transfer may be interrupted due to WiFi signal issue etc. Try a few more times and see if it succeeds. I can connect to my OpenSprinkler and trigger one of the valves to run, edit the time, etc. so I’ve got the password correct. I connect from my desktop, my phone, my tablet, etc. Trying the transfer several more times gets the same result. I am having a problem after the update. I manually updated the software from an SSH connection to the RasPi. The OpenSprinkler software is running as is Apache2. I cannot connect to the web page. It just times out. I did not save the settings, and the sprinklers are currently NOT running. I have the same issue. Apache2 is running but the web server is not responding. This reply was modified 9 months ago by dman776. If you don’t want to install new Raspbian, you can also roll back to an earlier firmware, but next time there is a firmware update you will encounter the same issue again, so it’s better to just solve it now. Update 25th Nov: tried several times, update failed. Update 18th Nov: tried again, update failed. Tried to update firmware 7th Nov 18, several attempts tonight. 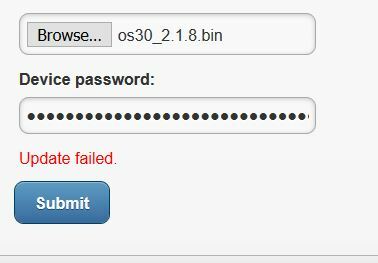 Used web interface to change password and log in again, just to be sure. Typed this post and tried again, failed. Would only need to download once a day at 1am. Log retrieval takes a long time or fails, hopefully new release increasing log space from 1MB to 3MB helps. Not sure why the log file on 7 stations would ever exceed 1MB over 7 days. Local time shown correct in app but red line in preview lags a couple of hours. This reply was modified 5 months, 1 week ago by Ian. This reply was modified 5 months ago by Ian. @ian: just to make sure: when typing http://#.#.#.#/update you need to replace #.#.#.# by the actual IP address of your OpenSprinkler — #.#.#.# itself is not a valid IP address. Finally got around to working on this. It turns out I was trying to update the firmware from my desktop, which is connected via cable to the router (I can log into the controller, do all the typical settings, etc.) However, when I tried from my laptop using wifi, updating the firmware worked immediately. Thanks for your response Ray, yes I did substitute the same numeric IP address that I successfully use to log in to the web interface. I see Jeffhaas in post #53408 had some success using his laptop over WIFI, but that implies he had the Opensprinkler in AP mode? My reading of the firmware update instructions I tried alternative #2. Update over WIFI. I’ll try alternative #3. Update via AP mode, I wonder if that’s what Jeffhaas means “when I tried from my laptop using wifi”, Jeff might chime in here. One thing that would be nice with the updater web interface, if the diagnostic messages didn’t overwrite, but scrolled down the page so I could read all of them. They flash on and off too quickly to read. I will wait until the weekend to do this when I have more time, in case I have to reset to factory and reprogram my sprinkler settings manually. I had the Opensprinkler in regular running mode. As I said, my desktop is connected directly into the router via Ethernet cable. I can log into the Opensprinkler, set up schedules, trigger manual run times, etc, as I sit at my desk and look out over the backyard. But trying to log into the updater didn’t work – I could get there but then it failed. Getting out a laptop and connecting via wifi to the same interface worked, quickly and easily. Logistically its better too, take the laptop to the controller, download the latest OS binary, download the latest controller config file, update the firmware, reconnect the controller to your WiFi, press controller button 1, reopen the web interface, change the password, reimport the config, all good to go. You could do it in 2 minutes. Thanks for Jeff and Ray’s help. Ian and Jeff: ok, thanks for the update. I am puzzled by why it only works with WiFi connected laptop, really can’t think of a good explanation for it. But I will try it with a direct wired connected computer and see if I can reproduce it. Jeff, are you able to edit your original post and append [SOLVED] to the end of the subject? I’ve found this very helpful in other forums. i just saw your mails and i assume from your links that you are also located in Canberra. I have an OSPI connected and started to look into the Zimmerman method (got it two weeks ago). You seem to have adjusted the Zimmerman values and it works for you. My program scheduled in the morning at sunrise does not really work. are you willing to share your values that would be great. i will also have a look if we could use bom data from your link, that would be even better. btw. i am in Evatt.